Established in 2012, Jenson Funding Partners have now invested over £12 million in 82 companies through both SEIS and EIS. Through our EIS we have facilitated 18 additional follow on funding rounds into our existing SEIS investee companies, unlocking between 5 and 10x our investment amount from external investors. Each follow on funding round generated an independent valuation, which enables us to calculate the new Net Asset Value for the funds. Proving it’s not just theory, Jenson have confirmed that they have completed on the first exit by an investee company. » Investing in our existing portfolio of companies (82 already funded) via our EIS, combined with new innovative and disruptive technology firms via our SEIS. » A mixture of follow on funding into growing companies previously invested in by Jenson SEIS & EIS funds and the potential for new companies to be included. » Ability to choose either EIS, SEIS or a blend for investments. » Targeting a minimum of 10 SEIS and 5 EIS entrepreneurial high growth companies, giving diversification. » Target return of £1.85 per £1.00 invested over 5 to 7 years. Jenson Funding Partners is a sector agnostic, conviction investment house, meaning that the investment landscape is broad in nature and the opportunities we start investing in via the SEIS have every opportunity to succeed supported by follow on funding via the EIS. 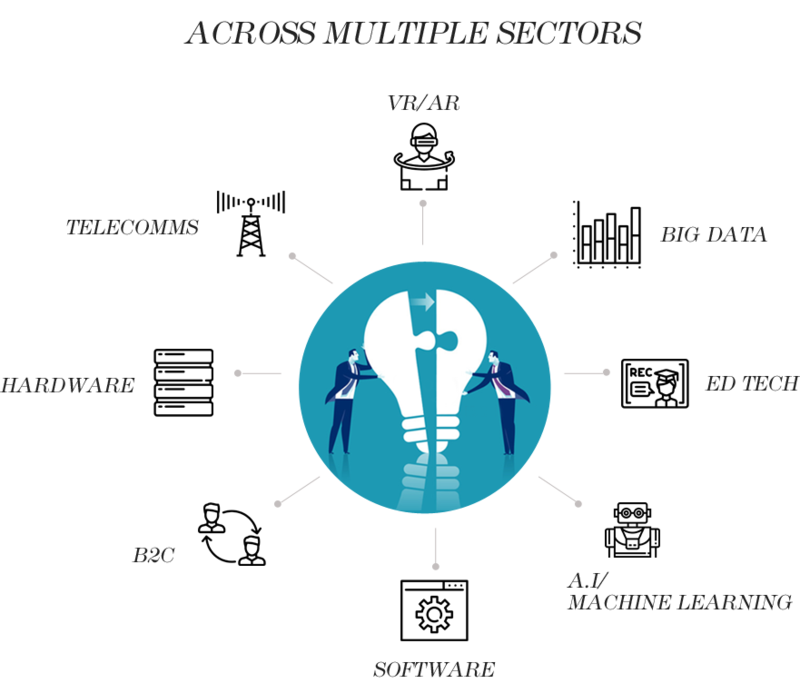 With a good source of potential investee companies sourced from our sister company, Jenson Solutions, and our own extensive network of contacts, we invest in many sectors. The Fund has a mandate to focus on long-term capital growth, enabling private investors to invest in a range of committed, ambitious entrepreneurs and their early stage growing companies. All companies will be small unquoted UK companies which have been trading for fewer than two years that qualify under the SEIS/EIS tax rules. 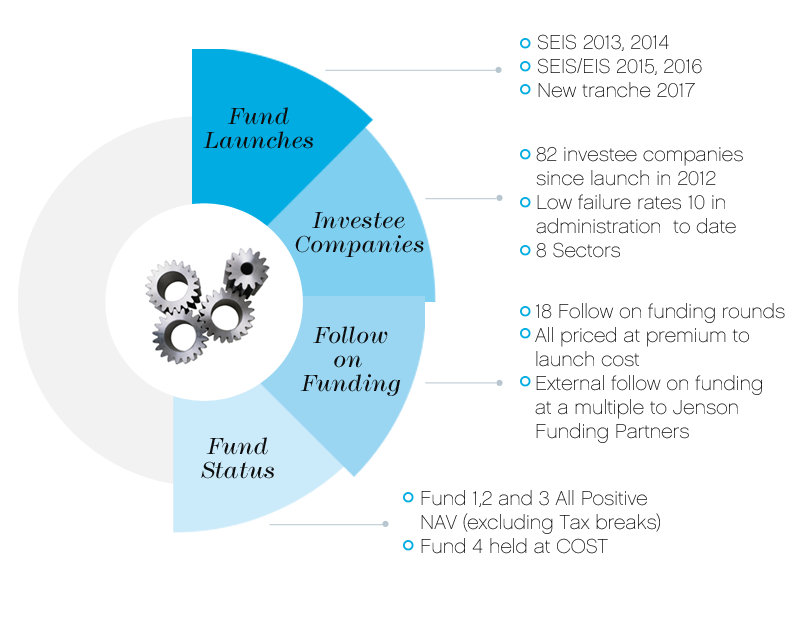 The Fund is a generalist fund, thereby the sector focus is agnostic and the type of businesses and opportunities can be anything that is SEIS/EIS compliant (typically small early stage companies in non-capital intensive sectors). The specific focus of the Fund is to target companies with: strong management, momentum in the business (i.e. not pure start-ups) and low risk for a start-up (e.g. have a low cash burn). Specifically, the EIS Fund will concentrate on the best of Jenson’s existing portfolio (>50 companies) but will always be bench marked relative to new external company opportunities. Jenson perceive that the EIS market is highly completive in businesses which are typically generating £1m of revenue. This has the effect of driving up prices as there are a very small number of deals the demand for which can lead to oversubscription. Jenson has internal access to extensive and existing SEIS portfolio that enables follow on funding at a fair price. Scenario 1. The Investee Company elects to cease the support services after 3 years. If you are interested in further information about Jenson Funding Partners EIS Fund or SEIS Fund, please contact us on info@kuberventures.com or +44 (0) 20 7952 6685.